Hand carved ear plug from genuine buffalo horn with skull bone inlay "The Punisher"
Since buffalo horn is rarely available rare in large sizes, this plug is manufactured from size 24mm alternatively of dark Sonoholz (Sonokeling / Indian rosewood). See more pictures to the listing. Water buffaloes are kept in Southeastern Europe and Southeast Asia as farm animals. He gets his name because of his predilection for cool and wet places on hot summer days. In comparison to cattle, it adapts better to climatic changes and is more resistant to diseases. The horn of the water buffalo is popular amongst jewelry manufacturers but also bow makers and knife makers. 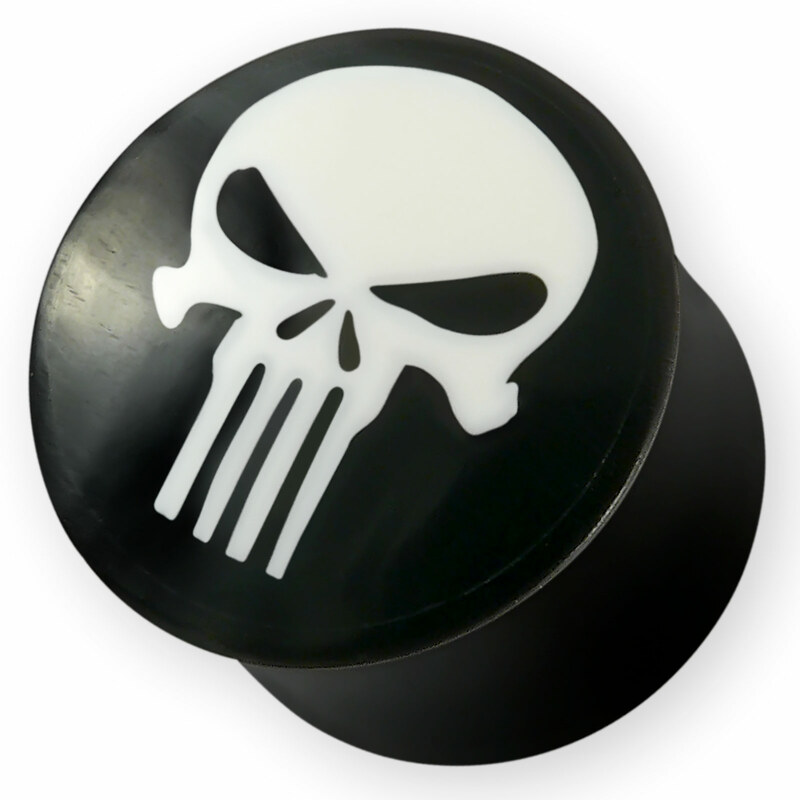 The Punisher is a fictional character in the Marvel Comics. He's a criminal hunter, pursues vigilante justice and does not shy away from violent practices. Driven by the murder of his wife and his son, Frank Castle leads a vendetta against all criminals. As a war veteran, he is a master in close combat, stealth, strategic planning and the use of various weapons.